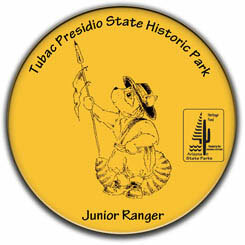 If you're between ages 6–12, you can become a Junior Ranger at Tubac Presidio State Historic Park! Pledge to do your part to help preserve the beauty of the park for everyone to enjoy! 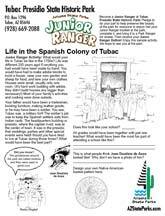 Life in the Spanish Colony of Tubac: What would your life in Tubac be like in the 1700s? Life was different 200 years ago! Everything you had would have been made by hand. You would have had to make adobe blocks to build a house, raise your own garden and sheep for food, and sew your own clothes. Houses were small, usually only one room. (It’s hard work building with adobe, they didn’t build houses any bigger than necessary!) Most of your family’s activities and cooking were done outside. Answer the following questions and design your own basket.